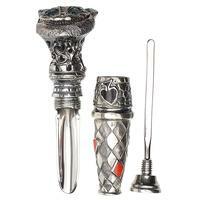 With an obvious Alice's Adventures in Wonderland motif, this intricate tamper from Alexander Glotov presents a whimsical style that doesn't skimp on practicality nor impressive handiwork. 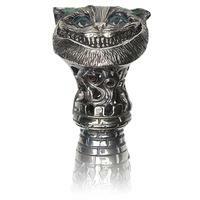 Rendered from electroplated nickel and silver (a process that increases durability and corrosion protection), this piece is most notably marked by the grinning bust of the Cheshire Cat up top, with hints of blue tinging the eyes and ears. 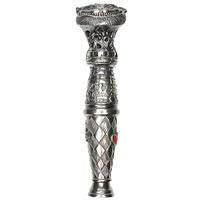 The head sits upon a robust castle turret, below which the rest of the tamper is adorned in patterns that call to mind the easily-angered Queen of Hearts. The whole piece houses both a scraper and pick, easily accessed by unscrewing the top and foot, respectively.